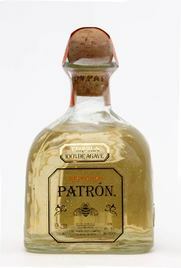 Patrón is a luxury brand of tequila produced in Mexico and sold in hand-blown, individually numbered bottles. 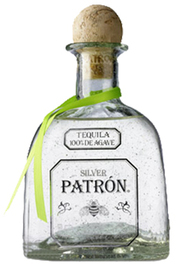 Made entirely from Blue Agave "piñas" (Spanish for pineapples), the Patrón Spirits Company is based in Las Vegas, Nevada, and was formed in 1989 by John Paul DeJoria, a co-founder of John Paul Mitchell Systems. 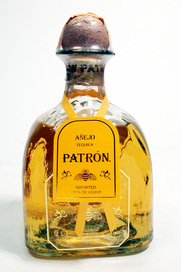 The Añejo 100% Agave was given a score of "90-95" from Wine Enthusiast in 2011. Brilliant crystal clear in appearance; pronounced aromas of citrus rind, melon and cucumber with notes of herb and smoke; initial palate is rich, sweet and ultra-smooth, with flavours of lime/citrus, spice with peppery and light briny notes on the long complex finish. Very pale straw colour - almost water like. Moderately aromatic nose releases aromas of char grilled pineapple, sweet tobacco, white pepper and a touch of nutmeg. Full bodied and round, the soft, warming spirit carries flavours of roasted capsicum, clove and vanilla building into a spicy, salty, black pepper power wave. Reasonable length with an aftertaste of salted green capsicum and black pepper. Pale straw colour with a water-like hue. The aromas are relatively subdued, revealing subtle notes of charry vanillin oak, liquorice, old tobacco and clay. The full bodied palate is exceptionally smooth offering flavours of sweet spice, baked citrus and a hint of peppermint. Very gently warming. The aftertaste fades a little too quickly, becoming dry with very subtle flavours of liquorice, spice and cedary oak. Clear in color. A subdued nose of pine, agave, and key lime pie opens on the palate like water. It is overwhelmingly neutral at first, but then evolves into measured waves of agave fruit and mint notes. The flavors and subtle heat are nicely in balance. Continues with a long finish of minerals and black pepper. Full bodied for a Blanco...don't mix this, it would be a waste. 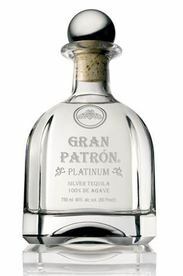 Off the charts smooth and pure - often hailed as the world's finest Platinum Tequila, this is a style for connoisseurs and will probably cause arguments even amongst those who think they know what their arguing about. 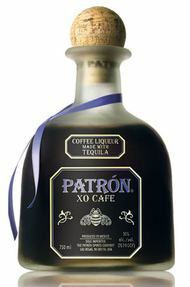 "Patron XO Cafe is an extraordinary blend of ultra premium tequila and the pure, natural essence of the finest coffee. The taste is dry, not sweet as with most low proof coffee liqueurs. The higher proof brings out the flavor of the pure coffee essense and the ultra premium tequila. It is excellent for sipping as well as a premium ingredient in a cocktail or as a unique and delicious dessert topping." 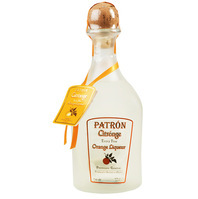 "Patrón Citrónge is a premium reserve, extra fine orange liqueur. It is the only pure, natural orange liqueur that is distilled in Mexico and exported to the United States. " Initial taste is strong on the front of the tongue, with a noticeable amount of alcohol taste in the back of the nose. Mouthfeel is extremely pleasant – smooth and fine. Perfect in fact. The mid-taste bursts and fills the mouth and sides of the tongue with a very pleasant flavor which subsides into the finish. However, a sneaky little burn follows down the throat – not unpleasant, just noticeable. The mid-taste is by far it’s best point, and this extra burst of taste would warrant a cocktail that could handle it.